Roth Händle studios: There is a right and a wrong way and a right way. Yesterday was my first day back in the studio after a couple of days off. I worked on the Akaba album as we have some mixdates booked with Alar Suurna and we are actually hoping to finish this album fairly soon. The song we were working on was a remake of an old track called Fake it. The day started with me recording drums on the track. Everything was already miked and set up so it took maybe 30 - 40 minutes to get the right take. After that I did Three different treatments on the drums. I always record the AKG reverb as it sounds so luscious and then I did two treatments using the Boss digital delay to get more movement in the drumtrack. Also by panning both delay bounces you get some good headphone candy going on. On the track we had just a very simple bass in the choruses. I couldnt actually pinpoint what sound it was. It could have been the bass or tuba sound from the Taurus pedals or possibly something very clean from the Yamaha DX-100. The bass sound worked but it could use a bit more character so as Tobias Ljungkvist had arrived we used an old Hagström bass through a guitar amp to get more grit and attack into the sound. The sound was fairly thin but we didnt really need more bass just some framing eq-wise. After we had recorded the bass we decided to try something different. In a previous blog I wrote about the ideas I have floating around...one of them was making an ep or an album completely based on the VCS3. Well I thought I could start by trying to record some bass on the Fake it track. So as I dont have a keyboard for the VCS3 I decided to do it old school. First tune oscillator one, then oscillator two and then oscillator three....record the first note on the chorus and start retuning the synth for note number two and so forth. The sound was really huge and really organic. But for me it had a completely different worth. It sort of connects to those first pioneers of Electronic Music who worked with tape and very few and primitive possibilities. So where other people might feel that it is archaic I get a certain kind of rush to do it like this. 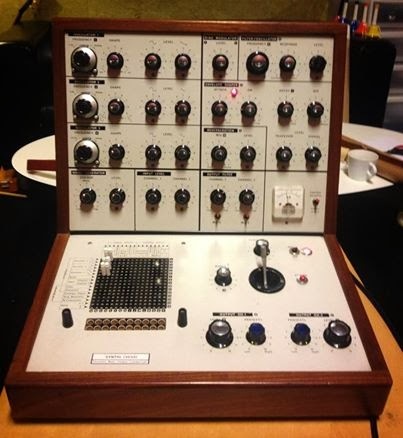 Also using the VCS3 as a tonal instrument and not just as an effect unit feels very cool. So when I posted the picture on line I wasnt really prepared for the onslaught about how very very very important it is to have a keyboard for the VCS3. And how very very very bad it is to use it as a signal generator. This sort of woke a question with me....is there actually people out there who seriously think there still is a right or a wrong way to record things? And how does that actually realate to this song and this bassline? Im very happy that people take the time to write....at all. But it surprised me that people were so opinionated about this. Old rare equipment seems to stir up a lot of emotions in people. There seems to be a consensus that there is a right or a wrong way. I feel quite puzzled by this absolute way of thinking. I tend to think more about songs and lyrics and atmospheres. Thats my job. If other people want to view them as museuem pieces they are very welcome to do so...I have albums to record. The rest of the day moved on fast and fun. For the verses we added a Cembalo ostinato pattern that pushed the track in a completely new direction. I did a treatment on it using the Zvex lofi loop junky which made it sound like a warped 78 rpm record but it was a bit too much so we used it on the outro instead. This will tie into the other tracks on the album that have more of a sample cut and paste feel. The last thing we did was to work on the middle eight which had a very simple Fender Rhodes line...It needed a bit more atmosphere and colour so we treated that thru the RE-501 tape echo. Mine isnt feeling too great and is incredibly wobbly which gives the sound an almost Sigur ros haunting quality. Feedback heaven with ghosts making out around it. After we were done with Fake it we started working on a track called Åsas sång (working title). We started by bouncing between sounds on the Mellotron M4000D but it just felt stale and boring. The Chamberlin Cello is a remarkable sound but it feels like its tooo nice and tooo great so we decided to turn it off and then Tobias had the idea of using the Roth Händle Pipe Organ instead. And four takes later we had a remarkable very solemn sounding track. The basic background was a live take of Åsa singing and Tobias on the grand piano so very little was needed....and the pipe organ hit the spot. Working with Tobias is always a pleasure. He is fast, positive and very sensitive to the music we are working on. Always great discussions (not only about the Music we are working on) which pushes Everything forward and gives everything more depth and understanding. Tomorrow we will continue trying to finish some more tracks. Its gonna be fun fun fun.